"My friend here wants to take diggings, and as you were complaining that you could get no one to go halves with you, I thought that I had better bring you together." Sherlock Holmes seemed delighted at the idea of sharing his rooms with me. "I have my eye on a suite in Baker Street," he said, "which would suit us down to the ground. You don't mind the smell of strong tobacco, I hope?" "I always smoke 'ship's myself," I answered. George, of the Scotland Yard! Thus begins one of the best friendships (dare I say bromance?) in literary history: that of Sherlock Holmes and Dr. Watson, sleuth and sidekick of Sir Arthur Conan Doyle's novels and short stories. Sure enough, 221b Baker Street is a real place, now fashioned into the Sherlock Holmes Museum. Upon entering, you'll go up to the first floor and find yourself in what is fashioned to look like Holmes's and Watson's living room. Yes, you can sit in the chairs in front of the fireplace, and if you're so inclined, try on their hats. Next door is Holmes's bedroom. 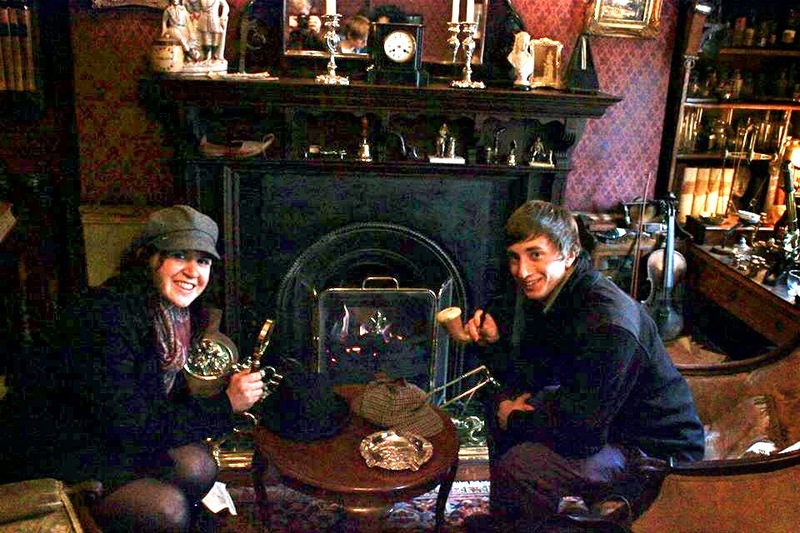 I'm in Watson's chair and Josh is in Holmes's in the living room of 221b Baker Street. Wax figures of Watson and Holmes. Though the top floor is probably the most bizarre. There you'll find several wax figures that depict the classic scenes. Kind of cool, but also kind of scary. Naturally, you can conclude the tour by stopping in the gift shop next door, where you can find magnifying glasses, pipes, hats, and all sorts of Sherlock Holmes memorabilia.